AlumiCutter Rulers let you measure and cut without changing tools! They feature a raised edge that's ideal for inking, plus a groove that protects your fingers while cutting. 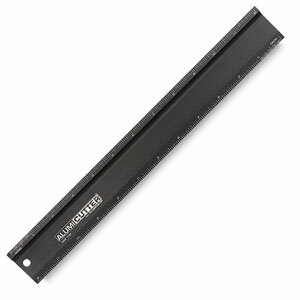 Designed especially for heavy-duty cutting purposes, this AlumiCutter has a steel edge that can safely be used with a rotary blade.  AlumiCutter is a trademark.